A black hole, among the most mysterious elements in the universe, is all that remains of a massive star that has used up its nuclear fuel. Lacking energy to combat the force of its own gravity, the star compresses or shrinks in size to a single point, called a singularity. At this point, pressure and density are infinite. Any object or even light that gets too close to a black hole is pulled in, stretched to infinity, and trapped forever. Black holes, so named by American physicist John Wheeler in 1969, are impossible to see, but may account for 90 percent of the content of the universe. English geologist John Michell and French astronomer Pierre-Simon Laplace first developed the idea of black holes in the eighteenth century. They theorized that if a celestial body were large enough and dense enough, it would exhibit so much gravity that nothing could escape its pull. This idea can be explained by looking at the effects of gravity on known objects. To break free of Earth's gravity, a spaceship has to travel at a speed of at least 7 miles (11 kilometers) per second. To escape a larger planet like Jupiter, it would have to travel at 37 miles (60 kilometers) per second. And to escape the Sun, it would have to travel at 380 miles (611 kilometers) per second. A large and dense enough object could require the spaceship to go faster than the speed of light, 186,000 miles (299,000 kilometers) per second. However, since nothing can travel faster than the speed of light, nothing would be able to escape the gravity of such an object. Black holes, indeed, are such objects. Once a star's nuclear fuel is spent, it will collapse. Without the force of nuclear fusion pushing outward from its core to balance its immense gravity, a star will fall into itself. Average-sized stars, like the Sun, shrink to become white dwarfs (small, extremely dense stars having low brightness) about the size of Earth. Stars up to three times the mass of the Sun explode to produce a supernova. Any remaining matter of such stars ends up as densely packed neutron stars or pulsars (rapidly rotating stars that emit varying radio waves at precise intervals). Stars more than three times the mass of the Sun explode in a supernova and then, in theory, collapse to form a black hole. When a giant star collapses, its remaining mass becomes so concentrated that it shrinks to an indefinitely small size and its gravity becomes completely overpowering. According to German-born American physicist Albert Einstein's (1879–1955) general theory of relativity, space becomes curved near objects or matter; the more concentrated or dense that matter is, the more space is curved around it. When a black hole forms, space curves so completely around it that only a small opening to the rest of normal space remains. The surface of this opening is called the event horizon, a theorized point of no-return. Any matter that crosses the event horizon is drawn in by the black hole's gravity and cannot escape, vanishing across the boundary like water down a drain. Black holes cannot be seen because matter, light, and other forms of energy do not escape from them. They can possibly be detected, however, by their effect on visible objects around them. Scientists believe that as gaseous matter swirls in a whirlpool before plunging into a black hole, that heated matter emits fluctuating X rays. Discovery of such a condition in space, therefore, may indicate the existence of a black hole near the source of those X rays. In 1971, an X-ray telescope aboard the satellite Uhuru detected the first serious black hole candidate in our galaxy, the Milky Way. A black hole is believed to be the companion star in a binary star called Cygnus X-1 (a binary star is a pair of stars in a single system that orbit each other, bound together by their mutual gravities). Cygnus X-1 is emitting intense amounts of X rays, possibly as a result of the unseen companion pulling in stellar material from the other star. Binary star: Pair of stars in a single system that orbit each other, bound together by their mutual gravities. General theory of relativity: A theory of gravity put forth by Albert Einstein in 1916 that describes gravity as a distortion or curvature of space-time caused by the presence of matter. Pulsars: Rapidly rotating stars that emit varying radio waves at precise intervals; also known as neutron stars because much of the matter within has been compressed into neutrons. White dwarf: Average-sized star that has collapsed to about the size of Earth and has extreme density and low brightness. In the 1990s, the Hubble Space Telescope provided scientists with evidence that black holes probably exist in nearly all galaxies and in interstellar space between galaxies. The biggest black holes are those at the center of galaxies. In the giant galaxy M87, located in the constellation Virgo, swirling gases around a suspected massive black hole stretch a distance of 500 light-years, or 2,950 trillion miles (4,750 trillion kilometers). In early 2001, scientists announced that data from the Chandra X-Ray Observatory and the Hubble Space Telescope provided the best direct evidence for the existence of the theorized event horizons. The two Earth-orbiting telescopes both surveyed matter surrounding suspected black holes that eventually disappeared from view. The Chandra telescope observed X-ray emissions that disappeared around six candidate black holes, while the Hubble telescope observed pulses of ultraviolet light from clumps of hot gas as they faded and then disappeared around Cygnus X-1. of collapsed stars that have, at most, 10 times the mass of the Sun. The second type, supermassive black holes, are believed to have been formed when the universe was very young. It is also believed they are the most common, existing at the core of every galaxy in the universe. These gigantic black holes have masses up to that of a billion Suns. In 2000, astrophysicists from the Harvard-Smithsonian Center for Astrophysics in Cambridge, Massachusetts, announced they had convincing evidence for a new class of black hole: midsize black holes. Using observations from the Chandra X-Ray Observatory of a galaxy about 12 million light-years from Earth, the scientists theorized the existence of a black hole in that galaxy with a mass of at least 500 Suns. How a midsize black hole like this forms, however, remains a puzzle for scientists. CAN YOU SEND ME ANOTHER TYPE OF BLACKHOLE FOTO( IF YOU HAVE THEM)? I totally agree with the last description of the picture. If we go from galaxy size down to the microscopic we can look at something that holds cells together. It is called laminin. 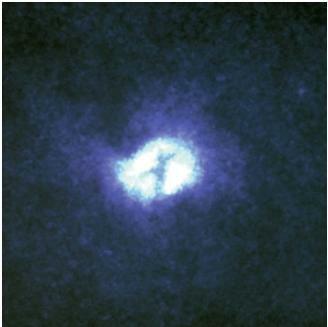 If you do a search on that and compare the picture of the heart of the whirlpool galaxy to what holds cells together, there is an amazing similarity. Seems to me that Someone had their hand in the creation of both! Ryan, nothing in the universe known to us can travel faster than the speed of light. Superluminous travel is impossible with todays current technology and theorys. Only a tachyon, a hypothetical partical, is beleived to travel faster than the speed of light, but it has it's own set of rules which let it do so. The picture of the core is awesome.... As Nathan said,Someone had their hand in its creation.